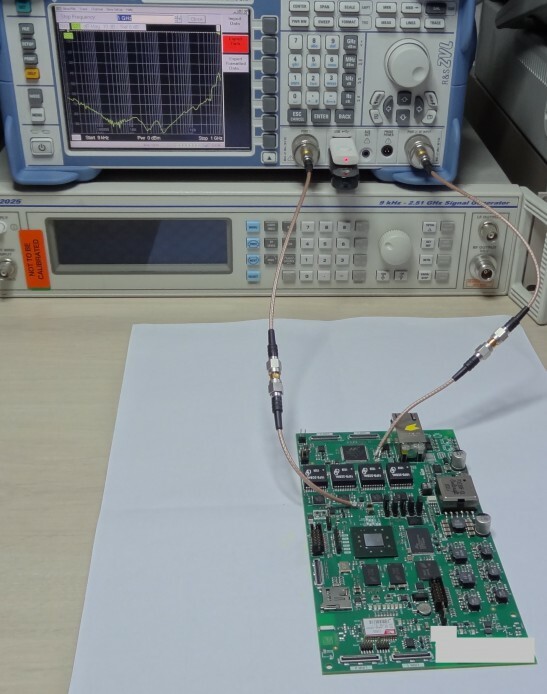 The post on the importance of the distance between the measurement points used when measuring the impedance of all the bypass capacitance on a board triggered another round of questions. Good. One of them is: Why not measure the impedance on a fully populated board i.e. a board with all parts mounted? And indeed that is a great idea, if that is what you have. In this case the client was nice enough to provide both this fully populated board and a board with only the bypass caps mounted, so it was very easy to do a comparison. The RF output in the network analyzer is set to 0dBm. But since the generator is 50R and the impedance between power and ground is maybe 0.01R, the signal is attenuated around 500x and such a small voltage is harmless to the other parts on the board. Since there is going to be additional capacitance in the IC packages on the fully populated board, we would expect the impedance to be lower when measured for the populated board versus the “caps only” board. And that is exactly what we see. Here is the result of the two boards. The red curve shows the effect of the board and its 23 capacitors (5x100uF, 6×4.7uF, 12×0.47uF) only. The green curve shows the effect of this plus the Xilinx Zynq IC with it’s on-die and on-package capacitance. Remember that above about 100 MHz, the results are not really interesting as the impedance is dominated by board resonances. This is about where we see the two small dips on the green curve. Those are most likely coming from the small capacitors on the package substrate. Also notice that the impedance at the lower frequencies will be lower when the board is powered up due to the active regulation of the power supply which may effective up to 10s of kHz. 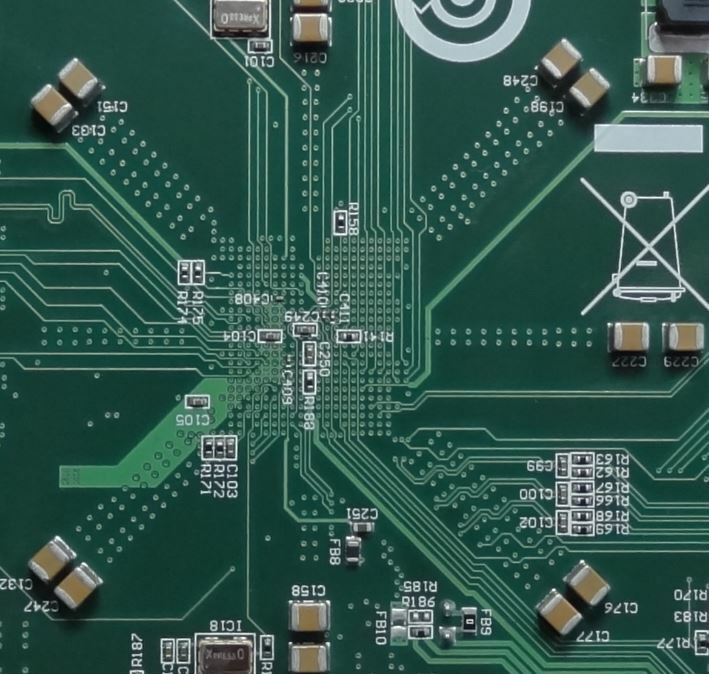 With the FPGA package and die capacitance in place, it would be nice to be able to take advantage of that when designing the PDN. 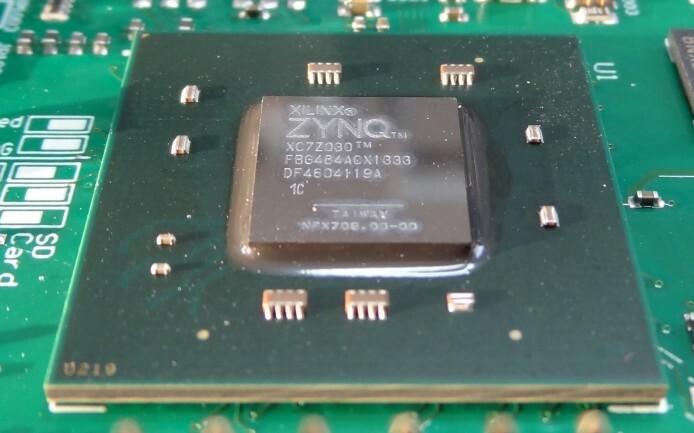 Xilinx chooses to disclose this information indirectly in the User Guide UG 933 by stating that board level bypass need only work up to 100 MHz and that power plane capacitance is not needed. If you want to learn more about PDN design, this is a key part of several of our courses. Find the best option for you or contact us to arrange an on-site course. The Zedboard is an eval board for the Xilinx Zynq-7000 FPGA. 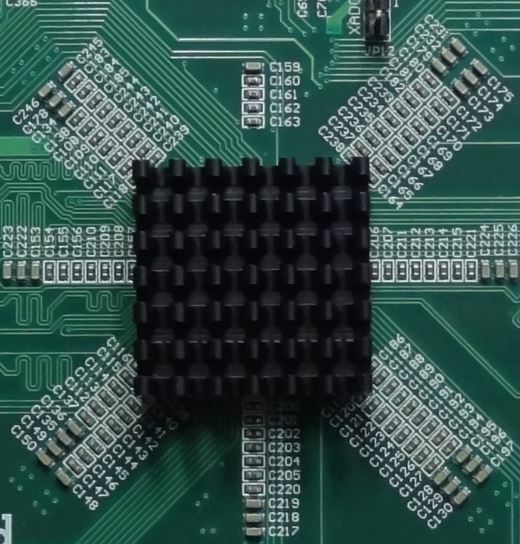 As such it may be nothing special, but when you look at the board you will notice a very interesting pattern of bypass capacitors. And there is a long story on the web page about why the designer thinks this is a good way to do bypass for a board like this. Decoupling power supply is one of the most important topics in signal integrity, so I found this to be an interesting board with a good story. Do you agree with the method used? Is the designer right? Or is it BS? Would you be able to make that distinction if this was in an application note? PS: If you sign up before the early bird 10% discount on The Nordic SI Week 2014 with Lee Ritchey ends on March 1st, you may win one of these boards. Thanks to Silica for sponsoring this. UPDATE (Jan 24, 14): I got the board in my hands now, so I could shoot some better pictures of this board from both top and bottom side. Building solid power distribution systems (PDN’s) is maybe the most important learning from the signal integrity training overall. Because it matters. Both for the logic functions, the signal quality (integrity) and for the radiated emissions (EMI). This short video shows how easily these measurements can be made using a network analyzer. The same method can be used with a spectrum analyzer (with TG option). The two boards used in the video are actual designs, one mounted with capacitors only and one bare. For the purpose of demonstrations both boards have been equipped with SMA connectors, so the measurements can be done easily with both hands free. Simpler methods for probing exists, and that may be a topic for another post. Usually probing it not a big issue, but obviously it’s easier when the boards have been prepared for probing. In reality the measurements work just as well on a board with all parts mounted, where you have the benefit of also measuring the capacitance on chip and package. The measurement is often referred to as a S21 measurement, as we measure the amount of energy that can pass through from port 1 to port 2 with this PDN placed as a big ugly load in the middle of the transmission line. Really we do not care about the phase in this measurement, only the amplitude. So you could argue that using a network analyzer is overkill. 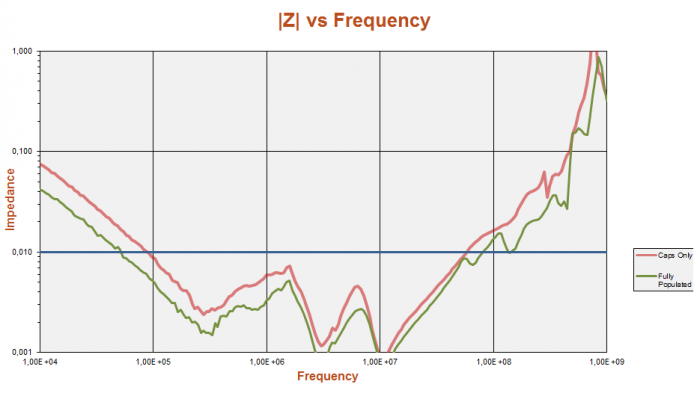 To put it very short: the difference between a network analyzer and a spectrum analyzer equipped with a tracking generator is that the network analyzer provides both phase and amplitude information – the SA/TG does amplitude only. Use what you got. This little network analyzer is quite handy for these measurements.